Asia's top refiner, China's Sinopec, has started work to build Southeast Asia's largest oil storage terminal at the Batam free trade zone in Indonesia, the company and industry sources said, in an $850-million investment aimed to boost petroleum trading. 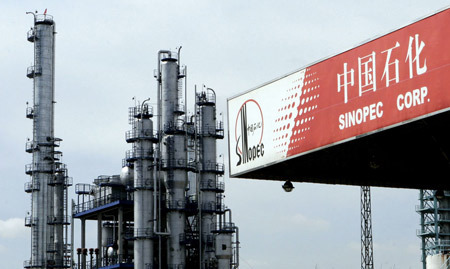 Sinopec Kantons Holdings, a unit of the Sinopec Group, will hold a stake of 95 percent in the PT West Point Terminal project covering the construction of storage for up to 16 million barrels of crude and refined fuels, the company told the Hong Kong Exchange in a filing on Tuesday. This would be Sinopec's first facility of such a size near Singapore, Asia's oil trading hub, where the Chinese refiner has established its presence over the past 15 years, trading refined products with a team of 50. "It should boost Sinopec's trading opportunities...and Singapore has run out of space to build such facilities," said a crude oil trader based in Beijing who deals with Sinopec. Sinopec's Asia crude teams are based in Beijing and Hong Kong. "Sinopec has a trading presence in Singapore and I imagine having a storage terminal in Batam, bordering Singapore, would be used to support their trading activity in the region," said Victor Shum, managing director at IHS Purvin and Gertz in Singapore. "I think the terminal has very little to do with energy security for China. It is a commercial decision." About 360 hectares of land in Batam's Free Trade Zone has been set aside, with a refinery and petrochemical project being considered in the second phase of development, a source familiar with project details said. Indonesian officials were not immediately available for comment. "For the moment, the immediate priority is to get the storage facility built, the refining and petrochemical projects are not at the execution phase yet," said a second industry official. "This has been a project which they (Sinopec) had been thinking about for a while now ... OK, at least two years in the making, this project is on a cluster of islands where some reclamation has taken place." The project edges the Chinese oil major closer to domestic rival PetroChina, Asia's largest producer of oil and gas, which has a stake of 35 percent in the 14-million-barrel Universal Oil Terminal on Singapore's Jurong Island. Industry sources said the project was originally planned as a joint venture between the Chinese refiner and OilTanking, a unit of privately held Marquard & Bahls, but did not work out. "The deal fell through after Oiltanking decided to go ahead to build a storage facility in Karimun (Indonesia)," an industry source said. "To be honest this came as a surprise. It's happened all very quickly." An invitation sent to select industry executives said Indonesian president Susilo Bambang Yudhoyono would preside at a ground-breaking ceremony set for Wednesday. The new storage facility is likely to take anything between 18 and 24 months to build, industry sources said. It will complement Singapore's role as the region's top trading hub. Singapore, which is about three and half times the size of the U.S. capital, Washington D.C., has been struggling in recent years to meet the region's expanding demand for oil storage. The reluctance of the Economic Development Board, its main agency for economic strategy, to free up more land to build oil storage facilities has triggered a series of oil infrastructure projects in southern Malaysia over the past 24 months. In late 2011, Vopak, the world's largest independent oil storage operator, began construction of a terminal project at Pengerang, a seaside town at the southern tip of Malaysia's Johor state. The 1.3 million cubic metre (cu m) facility, being developed with Malaysia's Dialog Group, is estimated to cost up to $700 million and be fully operational in 2014.